What fun we have with our Myacht! After our purchase, we updated her systems so we could rest assured that we could step on her at any time and take off cruising without a worry. That has been the case. 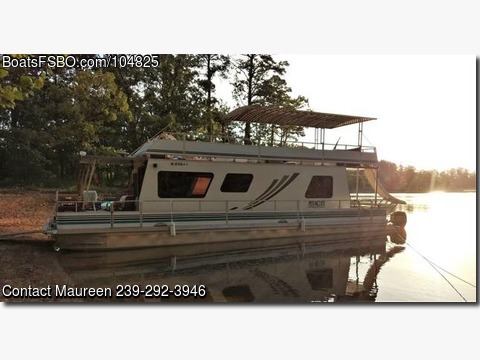 We don't use her as a dock condo, she explores Lake Ouachita and camps at many islands as time allows. This sweet boat is a memory maker! Here is what is new in 2017 and 2018... - 2 New Mercury Command Thrust Four Stroke 50 hp engines (with almost 60 hours run time at this writing) - Meticulous written records of engine hours and service - Quicksilver Commander 4000 Series Controls and New Cables - Lowrance Hook 5 GPS/Fish finder to 1000' - Color/Fixed Mount - 2 House Batteries and 2 Starter Batteries (one for each engine) - Samplex Power 3-Stage Battery Charger 30 amp - 1000 Watt Sine Wave Inverter - Xantrex - Potable Water Pump - Shurflo 4008 RV Revolution - Coleman Mach1 - 1 ton Air Conditioner with 5200 btu Heat Strip - Fuel Transfer Pump - New Fuel Pickups in each gas tank - External Water/Fuel Separator for each Engine - Galley and Bathroom Faucets - Pioneer CD RDS Bluetooth Receiver - Zinus Mattress and Additional Memory Foam Topper (Full Size Bed) - Fire Extinguisher - New Lines - Two large indoor/outdoor rugs on upper deck so you don't scorch your tootsies in the summer heat These are features/items which are just fine and we have not needed to update which are included: - Onan Generator - 4kw - Trackermarine Genset Series 4000KY - Just over 500 hours at this writing. - Uniden Marine VHF Radio - 10 cu. ft.
Whirlpool Refrigerator/Freezer - RCA 22" Flat Screen HDTV - Stainless Steel Grill - Propane Stove/Oven - Microwave Oven - Maple drop leaf dining table with booth on one side and chair on the other. - Glider Rocker - Kitchenware: Toaster, Blender, Coffeemaker - Miscellaneous dishes/pots/pans/flatware/cups that were on the boat when we bought it. - Bedding - Insulated Drapes at front and back sliding doors - Plenty of storage - Pull down/push up accordion shades on all windows (no cords to mess with) - Sunbrella Top on upper deck on stationary/sturdy welded frame - Spiral Staircase leading to upper deck - Slide with lake water pump - Assortment of outdoor deck chairs, chaise loungers, tables on upper deck. - 6 deck chairs and two small tables on main level. - Large fresh water tank under bed - 100 gallon wastewater tank with tank level indicator lights in bathroom - Two 50-gallon gas fuel tanks - Aluminum Pontoons - Floor is all aluminum with aluminum I-beams... no wood to rot. Yay! - Sturdy Aluminum Slide out Ramp - Carpet. Vinyl in bathroom. - Slip overlooking the lake, not another dock. Patio area on dock across from the boat with high top table/umbrella and chairs. - Patio has pull-out vinyl roof shade and lighting. - Dock has recently been completely rewired with new lighting - Extra large wood dock box. - Locking dock box on deck - Covered slip conveys and will be prorated. (Wonderful neighbors!) Serious inquiries only. If no answer, please leave a message and I will return your call at the earliest convenience. I am not looking for a broker so please don't bother calling me if that is your intention. Maureen ANSWERS TO QUESTIONS... 1. There is only one steering station which is inside. No upper steering station. 2. You can put a sleeper sofa or futon in the salon area. Plenty of room for additional sleeping. We also slept guests on top deck in summer on air mattresses. We found that we didn't have enough company overnight to require we put in additional sleeping areas. Air mattresses work great for here and there. 3. Slip Fee: 10/1/2018 for one year... $4912.75. This is $4570 + tax $342.75. 4. No, we do not wish to finance.